Today, we were able to find some time to visit the vet and have our "issues" checked-up. Chooey wasn't too excited at all about it. She looks sad doesn't she? Apparently, she knows the leash isn't good news. You'd think she knows she was going to the vet... or something (^_^). You must be wondering what she's thinking of. The Marikina Veterinary Clinic is my favorite dog and cat clinic. Before they do a dog check up, they'll cut the nails and remove the ear hairs of your dog free of charge. More importantly, they're very effective. This was where I brought Buchi when he got the nasty mange attack. The Marikina Veterinary Clinic consultation fee is 250 php (roughly $7). They were nice enough to exempt Buchi from the check-up fee as they only charged for Chooey's. Veterinary care doesn't get more generous and genuine than this. Chooey seems comfortable with her Vet Tech. 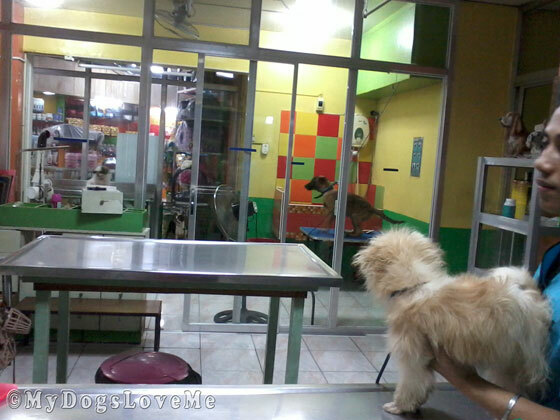 She's now looking at the Belgian Malinois in the grooming area while waiting for Ms. Vetty. You must be wondering where the mischief is. Ready for it? Luckily, Buchi's little boy area isn't as infected as we thought it was. In the mean time, the cone of shame- err, the Elizabethan Collar- will have to stay there for a week. 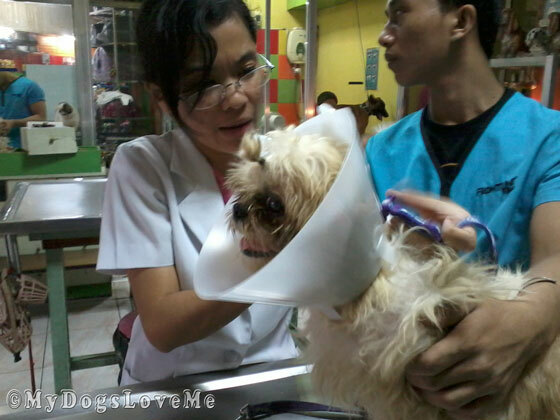 For more information about the Marikina Veterinary Clinic, you can visit this link. We're glad the v-e-t visit went relatively well, but are happier for you that it's over! $7 for a consultation?! Here in Canada, at the clinics in our area (and we're a small city, not a big place like Toronto, Montreal or Vancouver), the consultation fee is about $70 Canadian, which is pretty much the same in US dollars (we're around par right now). Ten times what you pay. The joys of living in the Philippines... But this means we also have cheaper salaries and service charges. Wow, I'm also surprised by the cost! It would cost Floyd or I AT LEAST $60 to see the dogtor! Glad Chooey doesn't have an infection. Oh no not the cone of shame. Have a great Monday and be well. A vet visit AND the cone of shame!!!! Not good..no not good at all! Just remember, it's all for the better. UGH, the cone of shame!!!!! Grrrrrr!! He looks very cute and sad. I hope he doesn't have to wear his EC for too much longer. I think all dogs know when we're taking them to the vet. When I try to turn the corner to the vet's block, BJ digs in and refuses to move. Wow, that is cheap! Fingers and paws crossed for a fast recovery. Nails cut for free? Mum has to pay nearly 10 squids each for us to have our nails cut, not to mention the consulation fee,sheesh! That's a great price. Did you find out anything about the warts on his mouth? Hope all is well soon. What a wonderful Vet. We hope Chooey is ok with the cone. Any news about the warts that are in his mouth? Yep...that's a very reasonable price! So sorry about the cone. I was happy to not have to wear mine any more! How khool woo got to see a Belgian Malinois! I spotted it even before I read your khaption! Oh that terrible thing around your neck, but I am glad your visit is all over,, and your home! Yes you looked soooo sad! Glad the vet visit is over but so sorry about the cone thing! Sending White Dog healing energies that the humiliation is short. What can I say, the Cone of Shame!! You poor thing…. Mowzers! What did they say about Chooey's tongue? And...CONE OF SHAME! EEEK! Linus used to like going to the Vet until he got neutered. Now every time we go to the Vet he jumps on my lap...not good with a 60 lb dog. Paws crossed for a quick recovery! Good day ! /i just want to ask for any help. 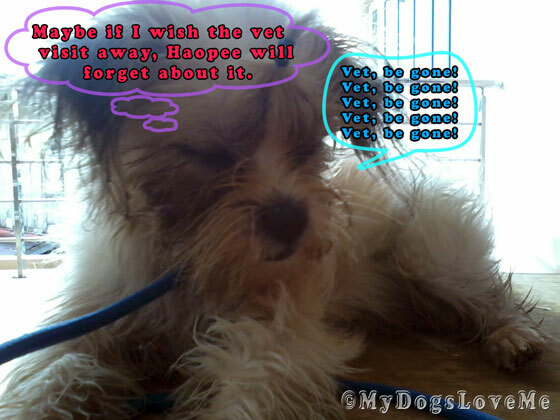 My dog is confined in the same veterinary clinic because of parvovirus. My dog is aspin and i dont have that much money to pay for the bills. what can i do to have discount or something so that i'll just pay fewer expenses?? Hi Abby. I'm sorry to hear that your dog has parvo. Last weekend, when we brought our pups for vaccination, one of the other customers had another dog with parvo. He/she was pooping bloody diarrhea. Pero nakadextrose sya at dun sya sa house nila inaalagaan. I truly apologize for not having replied so soon. Anyway, what the other customer did was to have their dog dextrosed while they brought it home instead of admitting it in the clinic. Yung parvo kasi will severely dehydrate your dog, so kailangan nya ng fluids. Malamang sa sobrang hina nya na ngayun, hindi na sya kumakain so kailangan nya ng dextrose. 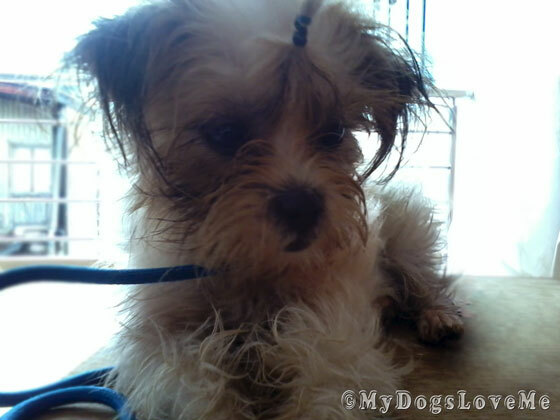 You could ask the vet if pwede bang dun nalang sa bahay ang dog mo idextrose. Dapat nakacrate rest sya... tapos pag nagpoop sya (which has a very foul smell) kailangang linisin kaagad.Always understand that malaki ang risk pag dinala mo ang dog sa bahay nyo na nakadextrose. Iba talaga pag may nagbabantay, pero i understand naman na vet care is expensive so it's an option to consider. Anyway, I pray na yung vet mo will understand. I-explain mo lang sa kanila ang truth, mababait naman ang ibang vet dyan. I hope your dog is getting better. P.S. Don't forget na if dadalhin mo sya sa bahay nyo na nakadextrose, kailangan mo sya iquarantine from the rest of your dogs kasi baka mahawa sila. Eh nakamamatay pa naman yan. Tapos when he poops, make sure na iclean sya ng maigi... use lysol and hose it down the drain. 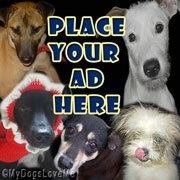 Make sure this dog's area is not accessible to the other dogs. And next time, remember that prevention is better than cure. ipabakuna mo na lahat ng dogs mo, ha?